The Savage River was flowing in the 500-600 CFs range when I hit the road last week for four days of fishing. The higher flows may not be considered ideal by most anglers, but there are still some options, even at these levels. 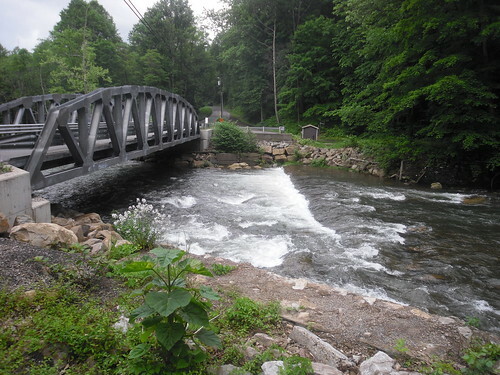 The region was saturated from recent rains and all of the smaller streams and upper Savage were flowing extremely high on Monday. The roar of the lower Savage was deafening, although the water was clear and fishable in a few sections. The water temps rose from the high forties to the low fifties with the spillover from the rain. I caught my first brown on a streamer in the first ten minutes, and landed a few more before setting up for the night at the campground. On Tuesday the flows came down into the 400-300 Cfs range and I switched from streamers to nymphs, catching a few fish. I switched to dries at Noon and quickly found fish looking up to the surface for a meal. I saw yellow sallies, midges, blue quills, march browns, blue wing olives, caddis and a few other mayflies hatching during the week. I mainly saw midge hatches and trout sipping them in the slow water, but I brought fish to the surface on a size 12 march brown/olive pattern. The challenge was dropping dry flies into the slow spots in the high flows, and getting zero drag during the short drifts. All the slow water along the edges, and the calm pockets behind or in front of rocks held trout. High sticking a long leader and dapping the dries was an easier technique than trying to sling heavy nymph rigs and streamers in the high water. By Wednesday the flows came down and I managed to raise two dozen fish, landing half of those fish. On Thursday the flow dropped into the upper 200s, and I fished dries all morning and switched to nymphs in the afternoon. The majority of browns I landed this week were between 6-14 inches, and brookies between 6-11 inches. In the higher flows I was able to sight fish to some larger browns between 15-19 inches in the slack water on the edge of the river. These wary browns only stayed put for a cast or two, before refusing and spooking or running off with my fly. The latest video post features the high water when I first arrived, a few insects I filmed, and some of the trout I caught. This entry was posted in fishing report, video on May 29, 2010 by Jason du Pont.